Munich Melodic Hard Rockers VAMP were another sad example for the way the music industry works.Signed by a Atlantic Records they released in 1989 the terrific "The Rich Don't Rock" album produced by Tony Platt (Foreigner) stuffed to the rafters with arena-ready choruses, hooky guitars and soaring ballsy vocals.But Vamp were victims of their record label shortsightedness and their album went nowhere commercially.Vamp started recording their only album in Holland but due executive differences several producers come and left until they finaly managed to get Tony Platt whom did a great job obtaining a brilliant and crisp sound.Vamp toured Europe supporting White Lion, Bullet Boys, Bonfire and others but meanwhile the record company didn't promote "The Rich Don't Rock" in any way.Disappointed with the scarce support, drummer Dickie left the band accepting the offer by no other than Bruce Dickinson to join him on his first solo world tour. After that tour he stayed in London and joined melodic rockers Skin. Soon the rest of Vamp disbanded.A sorrowful story for such talented band. 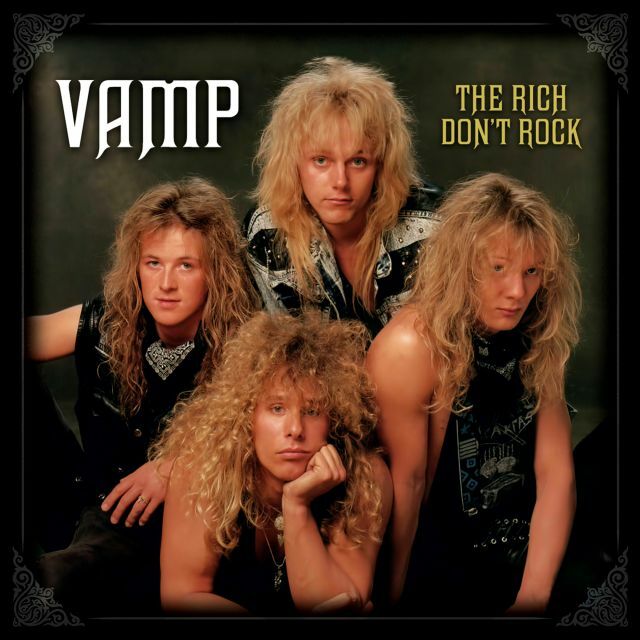 "The Rich Don't Rock" is a long-lost gem, something of a hidden Melodic Hard Rock classic blending American and European stylings with class and superb musicianship.Led from the front by the superb vocals of US born Tom Bellini (who really is a sonic deadringer for Tyketto's Danny Vaughan a lot of the time) and some fantastically pyrotechnic guitar playing from Ricolf Cross who adds something utterly smashtastic to every song, "The Rich Don't Rock" is chock full of great anthems and melodies ranging from fast-paced melodic hard rockers to polished AOR numbers.Take as example the three spectacular opening tracks: "Heartbreak, Heartache" where Scandi acts come to mind, the radio friendly Helix-like "Like I Want" and the thumping title track.But there's more highlights, in fact, all are great. "Love Games" rocks you with a killer riff & rhythm and vocals to die for, while the chorus sticks in your head forever.You'll be needing a rest after all that, so "Renegade" drops the pace a little – though not the intensity – in a meaty midtempo recalling Swedes Treat.And then... another moster song. "All Nite" kicks in the doors with Fliszar’s double kick drum assault and some more string-mangling solo mayhem from Cross. In the middle, Fliszar does an amazing 1:20 min drum solo full of rage and fire.Do you need AOR? The title of "Lonely Nights" speaks for itself (it isn't the perfect name for an AOR tune?). This a pure eighties keyboard driven golden song with screaming guitars in the mix. Musically, think Zinatra finest moments while the chorus is pure Europe-Joey Tempest circa 1986.Between these great after great tracks we have another diamond: "Stand By Me". An absolutely titanic melodic hard rocker in the mould of earlier Lillian Axe, it's absolutely epic, and if the album finished at this point you wouldn't be complaining.But Vamp continues rocking in an incredible way with the nasty little rocker called "Bleeding", a thrilling bass-propelled beast with blazing heavy guitars all over and a crunching climax that sends every needle into the red. Awesome.The foot-tapping does not stop with "Talk is Cheap" where Tom Bellini sounds like Kevin DuBrow in places and the band rocks with a live feel.We need balance for the end and the Americanized AORish "Shout" blast your speakers with a style reminding you Icon in the skeleton and Autograph during the chorus, all wrapped by swirling keyboards. 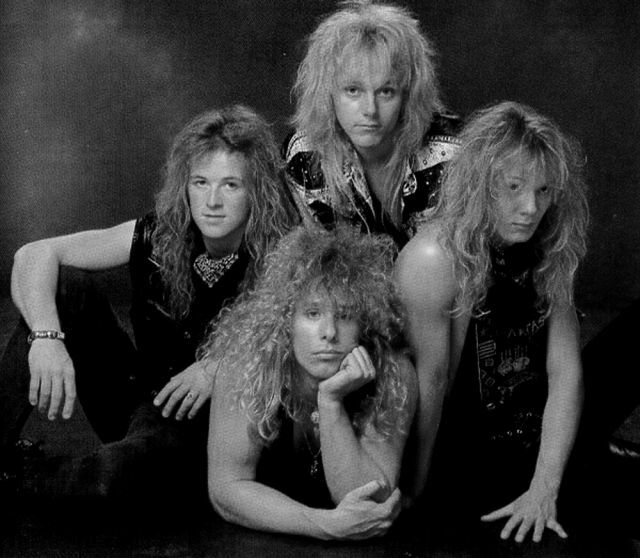 "Why" finally draws things to an end in a razor devastating hard rockin' style – a great way to end a monstrous, and monstrously overlooked slab of blazing Melodic Hard Rock glory.As you have read, "The Rich Don't Rock" is a pearl from start to finish, sadly overlooked and out of print since its original edition.Now, US label Divebomb Records has tracked down the members of Vamp and have partnered with the band to bring "The Rich Don't Rock" back with the love and attention it deserves. This is a dreamy 'Deluxe Edition' not only including the original album remastered by guitarist Ricolf in his own studio, but also a fantastic bonus CD.CD 1 contains the original album remastered plus 3 bonus: the impossible to find Vamp first EP (only 12'' vinyl) featuring noticeable - yet killer - different versions of "The Rich Don't Rock", "Why" and "Shout".And CD 2... 15 awesome previously unreleased tracks: 8 songs recorded for their unreleased sophomore album "One Smack Killer" and 7 TRDR demos including their 1986 demo under the name ROXX which is what got them signed. All these stuff was professionally recorded with great production, first class sound.